While it has “Persona 4” in the title, Persona 4 Arena Ultimax is really a sequel to Persona 3 as much as Persona 4—especially as Ultimax now includes every member of the Persona 3 main cast we are likely to get. Ultimax takes place three years after the end of Persona 3 (two months after the end of Persona 4 and a few days after Arena). Players of Arena already know what Mitsuru, Aigis, and Akihiko have been up to. Mitsuru, now a beautiful, full-grown woman, runs an anti-Shadow organization that works with the police to deal with Shadow crimes and other threats. Aigis works with Mitsuru as her primary field agent—and looks basically the same except for her increased armament. Akihiko has spent his days traveling around the world, getting into fights and building muscle (and gaining an apparent aversion to shirts) to be able to better help Mitsuru and the rest of the group in fighting the Shadows. While not part of Mitsuru's organization, Fuuka is top of her class at college and has grown up to become proficient in the repair and upkeep of anti-Shadow weapons like Aigis. She is more than happy to help the team during the events of Arena and Ultimax. 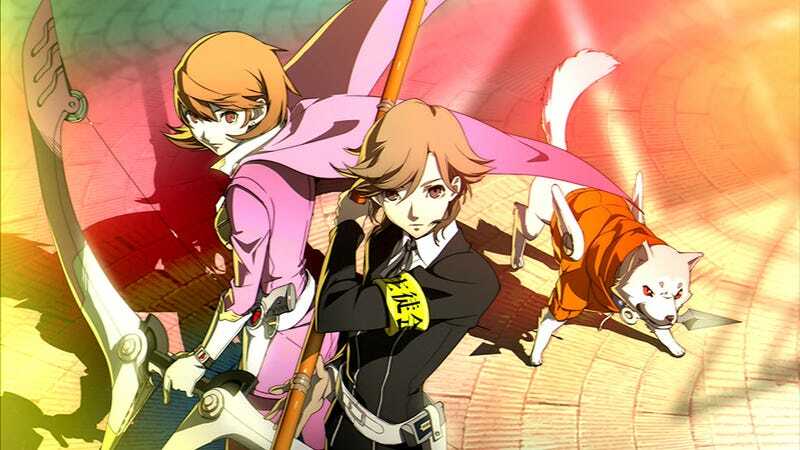 The story of Ultimax begins with these four heading back to Inaba to investigate a buildup of Shadow energy, only to be taken out in an ambush. Thus it falls to the rest of the Persona 3 cast to head in and save them. Yukari, now ostensibly a college student, spends most of her time on her career as an actor, thanks to her breakout role. She's totally a Power Ranger, you guys—the Pink Ranger and team leader to boot. Seriously, check out her introductory anime cutscene. Junpei, on the other hand, is a Little League coach who dreams of winning the World Baseball Classic. Ken is still a student at Gekkoukan, though now a middle schooler. He is a soccer star, is a member of the student council, and is more than a little popular with the ladies. However, he struggles with the idea that he has been left behind by the rest of the Persona 3 group and wants nothing more than to once again become a part of the team. Koromaru still lives in the S.E.E.S. dormitory along with Ken. He now wears Ken's orange hoodie from back in the Persona 3 days. All in all, if you are as invested in the Persona 3 cast as I am, you'll definitely want to pick up Persona 4 Arena Ultimax—especially with its 14-hour fully-voiced visual novel. And don't worry if fighting games aren't your thing: The game even includes a mode where the computer will do the fighting for you. Persona 4 Arena Ultimax was released in Japan on August 28, 2014, for the PlayStation 3. It will be released in North America for PlayStation 3 and Xbox 360 on September 30, 2014.